Last week saw lucky Bidibot.com user ‘ChipsFool’ win a seat at the London EPT side event for the amazing price of $2.53. 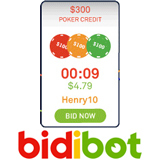 The thrifty online poker player took advantage of one of many daily online auctions for poker and casino credits at the new “eBay of online poker” that’s saving bargain-savvy online poker and casino players more money every day. The EPT side event, worth a whopping £1600, was held at Londons Hilton Metropole hotel on Saturday 2nd October 2010.